In the absence of a wood burning outdoor brick/stone oven (hint to Fred) our gas BBQ works well for baking pizza crust and making pita bread. I crank up the heat to the highest level it will go (the thermostat should be close to 500 degrees) and use a pizza stone that works on grills. I happen to have a granite stone, but Emile Henry makes one that is clay - these are the only two I know that are "BBQ proof, " but I'm sure there are others. Adam and I did try a traditional pizza stone and it cracked. In the winter its a bit trickier to heat the BBQ all the way to 500, test your BBQ before trying this. I started making pizza when the kids were little and we lived in Florida. Dominoes and whatever other chains were the only pizza choices and the pizza was terrible. Mikah commented, while in High School (do you remember this?) that her friends liked the pizza we made in our house. Adam asked me to buy the William-Sonoma imprint, Pizza and other Savory Pies, by Binns so that he could get some ideas for toppings and other dough recipes. There is also an easy pizza dough recipe in The New Basics Cookbook, Rosso & Lukins (from the Silver Palate series). The recipe I use is adapted from the one found in the Rosso & Lukins book. If you want to try making pizza, but the wait time and idea of creating bread dough makes you nervous, Fleishmann's yeast has a relatively new yeast specifically for pizza that requires no proofing time. You cannot make bread with this yeast; however, it makes decent pizza dough- better than the ready made par-baked doughs that you buy hanging in plastic bags in the supermarket. The recipe is on the back of the package - you can purchase this yeast in some supermarkets including Wegman's and A&P. The dough takes 30 minutes, start to finish. If you are reading this posting just to see what it says, but you have no plan to ever make pizza dough from scratch there are frozen and fresh ready made pizza doughs - a very good one can be found in the refrigerator section in Trader Joe's. Once you make a dough decision the cookbooks are useful for topping suggestions and ideas. Use your imagination to go beyond sauce and cheese. 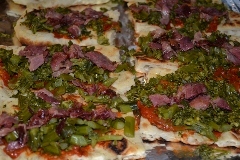 Pizza is a type of flat bread. I don't know how to "throw" the dough like a pizza parlor, although I think that Eli did learn how to do this and hasn't shown the rest of his family. I work the dough on a flat surface and stretch it out. When we're making it on the BBQ (Adam and I do make deep dish pizza, in a pan, in the oven) and it's being baked on a stone I don't worry about the shape being round. In fact, the stone we own is square and I want to maximize the surface, so I aim for a square or rectangle that fits most of the surface of the stone. If this makes our home made pizza inauthentic, so be it, it works. I par-bake several crusts before adding toppings, so that they can be made quickly in succession if we need more than one pizza and if the crust isn't needed, it can be cut into half or quarters, wrapped and frozen for use at another time as "individual" pizzas. Here is a basic pizza dough that we use for pizza baked in the BBQ (it is not the same dough that Adam and I use for deep dish pizza). We sometime use up to 1c semolina mixed with all purpose flour. The semolina makes the dough a bit more difficult - it tears more easily (lower gluten levels, less stretchability)- but it does give the dough a slightly different texture that is interesting. We have semolina flour in the house because Adam sometimes makes pasta. (you can use instant yeast if you prefer- just follow instructions outlined in the Challah recipe for hydrating instant yeast). 1. To activate the yeast- measure 2 c very warm water in a large measuring cup, mix in the sugar, add the yeast, mix slightly and let stand 3-5 minutes. The mixture will be bubbly and look like a lumpy bubbly mass on top of the water. 2. In a large mixing bowl, add the entire amount of flour, stir in the salt and make a well in the center. 3. Pour the yeast mixture into the well. 4. Using a flexible dough scraper, or a rubber spatula, mix the flour and yeast mixture. 5. Pour the oil over the mixed dough and continue to knead gently, in the bowl, with your hand. You do not need to kead this dough for more than 2-3 minutes. 6. Knead in the herbs /cheese if you decide to use them. 7. The dough will form a soft ball of dough with an oily glaze. Prepare the topping you plan to use before starting to cook the crust. Cheese and tomato sauce are an option, but we've used other kinds of toppings, for example hoisin sauce and sliced chicken or duck with chopped scallions or chives. Adam likes to use diced Morning Star Farms "buffalo chicken" (a soy product) and slivered bell pepper along with cheese and sauce. 9. Heat the BBQ with the cold pizza stone on the grill. 10. Gently de-gas the dough by pressing on it, remove to a flat (very lightly floured) surface) and fold a few times. Divide in half and let rest for a few minutes. 11. I gently stretch the dough out on the back side of a cookie sheet or a pizza peel that is sprinkled with cornmeal. Both work well, the peel is easier for me to handle, but it's one more piece of equipment that is nice to have, but optional. 12. Create a rectangle shape (it won't be perfect) slightly smaller than the stone. I don't roll the dough, it will stick or you'll have to add additional flour which will make it less pliable. Don't press the dough onto the surface of the peel or back side of the cookie sheet - it will stick and make it difficult to slip onto the hot stone. 13. The BBQ should reach (near) maximum temperature around 500 degrees if you have a thermostat on the BBQ. 14. Quickly slip (at an angle) the stretched dough onto the hot stone - be careful, it take a bit of practice, you will have a hard time repositioning the dough - you can't touch it - the stone is too hot. A metal spatula will be helpful to help shift it. The cornmeal will start to blacken, don't worry, it will not burn the bottom of the dough. 15. Close the cover of the BBQ and bake for about 8-10 minutes, check the bottom by lifting a corner. You want the dough to be partially cooked. You'll be able to easily slip the pizza peel, or a the cookie sheet (with the help of the metal spatula) under the partially cooked crust. Flip the crust over and let the hot stone cook for other side of the dough for 2-3 minutes. You'll get a smokey tasting crust this way. Work quickly so that it does not burn. 17. Leaving the crust on the peel or cookie sheet, arrange the toppings, return to the BBQ by slipping back onto the hot stone (don't add too much of the topping, it will get heavy and soggy and will be difficult to slip it back). 18. Continue baking until the crust is browned, topping is bubbly (about 10-12 minutes). You can lower the heat of the BBQ if you see the dough is cooking too quickly (for example, the dough is cooking quickly and the cheese, if you are using cheese, is not melting quickly enough). 19. Remove from BBQ with the peel, allow t cool for a few minutes and cut with either a pizza wheel or a sharp knife.